Artist Code 1301. Completed August 2013. Original SOLD. Water colour on Aquarelle Arches 100% hot pressed cotton rag paper. Framed size 22” x 18”. This painting was selected for and was sold at the National Exhibition of Wildlife Art (NEWA) 2014. 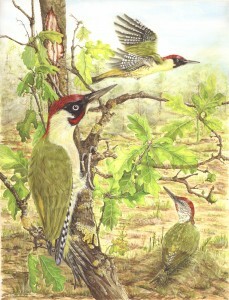 Green Woodpeckers (Picus viridis), young English Oak (Quercus robur). I play golf (Bourn, Cambridgeshire) and on 5 March 2013 whilst coming down the 18th fairway, I noticed some green woodpeckers hopping about around a young oak tree. I counted seven! Another dashed passed just above their heads and the others suddenly looked up (they were feeding on the ant mounds, and one was vertically perched on the trunk of the young oak tree). I suddenly remembered that a great photographer, John Betts, had given me permission to use one of his photographs as a resource (about 4 years ago! ), which typified the woodpecker that flew passed in a hurry. Two frozen green woodpecker specimens (one from the Golf course which may have been successfully despatched by the resident Sparrowhawk, but was disturbed before it could take it; and one undamaged road kill given to me by a friend) were my main resources. They really do have big dinosaur-type feet and claws, the outside two toes are longer and larger than the inside two. 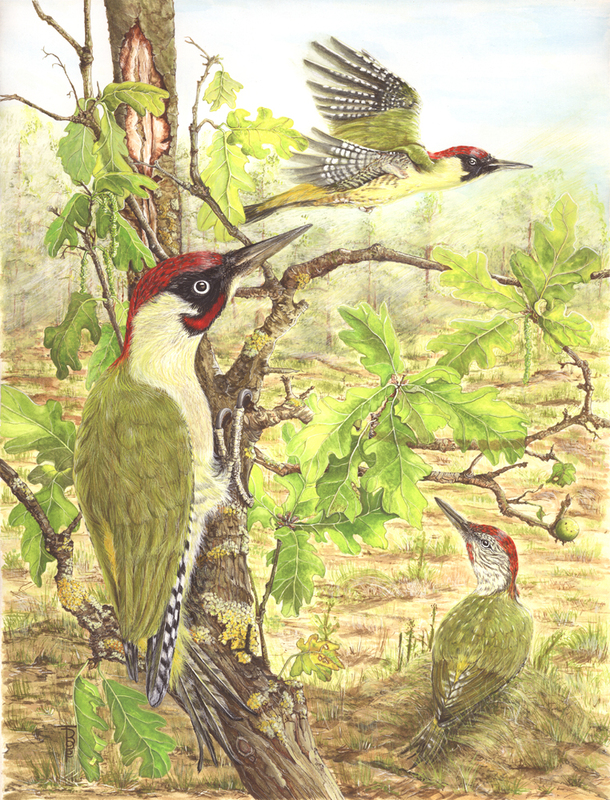 Did you know that woodpeckers have three eyelids? Males have an extra red bit under the eye in their moustache, whereas females have an all-black moustache (been there!!) and juveniles, typically, are all ‘spotty’! They also have a rather long, thin, pink tongue to which the ants stick when they plunge their bills into ant hills and lick up the bounty. Look out all, at one o’clock high!